Editor’s Note: This story has been updated to include more details about Oude Gueuze Cuvée René Special Blend and draft lambic for U.S. distribution. Thanks to a recent brewery expansion, the Belgian Brouwerij Lindemans will be able to expand its lambic production and for the first time release a special oude gueuze and a draft lambic in the United States. This should come as welcome news to those who appreciate traditional Belgian beer, as Lindemans is known for producing excellent lambics, and for their Cuvée René Oude Gueuze and Oude Kriek. Those who have sampled an oude gueuze from Belgian lambic blenderies (which use the unfermented wort brewed by lambic breweries to produce their own blends) such as De Cam, 3 Fonteinen, Hanssens, or Gueuzerie Tilquin, most likely had a Lindemans lambic as a part of their blend (as well as from the Boon and Girardin breweries). Dirk Lindemans of Brouwerij Lindemans. Photo by Charles D. Cook. 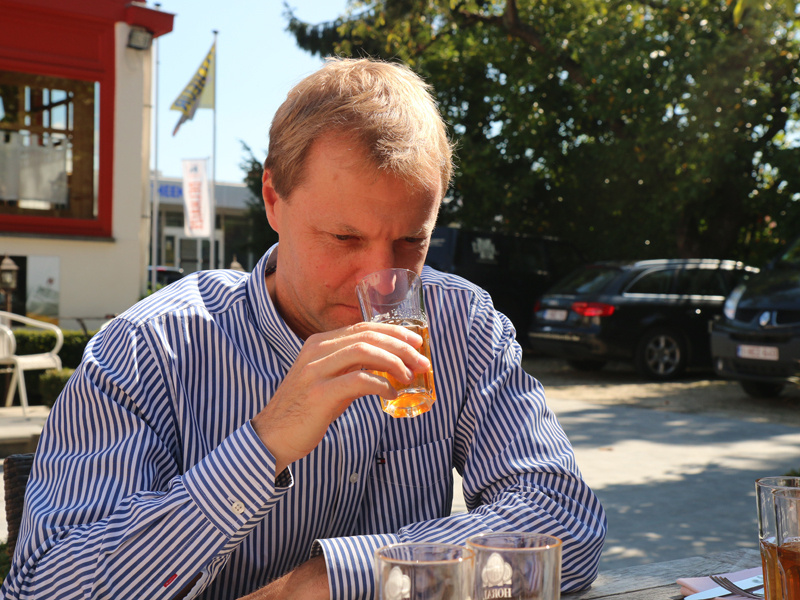 Brewery co-owner Dirk Lindemans, who runs the brewery with his cousin, Geert Lindemans, in Vlezenbeek, Flemish Brabant, said the expansion was necessary because customer demands around the world have never been higher. “To produce more Oude Gueuze, of course, we need more lambic. For that, we need more barrels. We currently have a storage capacity of 60,000 hectoliters in both stainless steel tanks, with wooden chips added, and foeders. We have 10 foeders in the 100-hectoliter size (about 85 U.S. barrels), and we will add another 10 or more foeders in the same size in 2015.” He said that the brewery also added a new bottling line and renovated a warehouse to house additional foeders. In addition to demand, consumer tastes have shifted. Last year, I tasted a lambic brewed in December 2010 right from a foeder, and it was a delight. It was very dry, with a soft, citrusy tartness, limited carbonation, and a moderately musty, sourish, “funky” aroma. The nearly 4-year-old spontaneously fermented brew was very thirst quenching and will leave you wanting more. Brewmaster Peters Renders said it would be part of a special blend that the brewery was working on, and that blend has now been bottled. “It’s called Oude Gueuze Cuvée René Special Blend,” Dirk Lindemans said. “Only 15,000 [75 cl] bottles were filled, and it is currently undergoing refermentation in the bottle. We plan to release it for sale in March, and we will be sending some bottles to the U.S.A.,” he said. Eighty percent of Oude Gueuze Cuvée René Special Blend is a lambic brewed on Dec. 7, 2010, and the remaining 20 percent of the blend was brewed in late 2013. As if that weren’t enough to pique your interest, Lindemans will also soon be sending one-year-old draft lambic, which is usually only available in a few cafés in Belgium, in 25-liter kegs to the United States, via importer Merchant du Vin. Additionally, Lindemans will be open for the Toer de Geuze on Sunday, May 3. It had been closed during the 2013 edition of the tour, which is an open house at most of Belgium’s lambic producers, due to the expansion of the brewery. In Belgium, you can taste Lindemans straight draft lambic at Café Vagevuur near Vlezenbeek, and perhaps a handful of other places. Also, I encourage anyone traveling to Belgium to seek out the Cuvée René Oude Kriek, a fine example of the style, which is not available stateside. Certainly, in my opinion, it should be. This dark-red brew has aromas of barnyard funk, oak barrels and sour cherries, with a very pronounced dark sour cherry taste. Oude Kriek is probably the tartest of the Lindemans beers. See lindemans.be and merchantduvin.com to learn more. Charles D. “Chuck” Cook is a writer and photographer who has traveled to Belgium 29 times since 1994 to explore, experience and enjoy its incredible beer culture. He has written for various publications, including USA Today, All About Beer Magazine and Celebrator Beer News, and his own website, drinkbelgianbeer.com. As a lambic lover, I am very excited to see some new Lindemans products available. We aren’t getting too many in central Indiana right now. I wish Cantillion was more available stateside as well.